By now you shouldn’t be surprised to hear that Robert Mueller almost never comes up on the 2020 campaign trail. Almost none of the Democratic presidential candidates are talking about Vladimir Putin in Ames, either, or Julian Assange in Concord, or Paul Manafort in Spartanburg, for that matter. The contenders almost all avoid bringing up the special counsel’s investigation into Donald Trump and Russia altogether, and on the (very) rare occasion that they’re asked about it by a voter or a reporter on the ground, they mostly follow a predictable script: They acknowledge its seriousness, they insist Mueller be permitted to conclude his investigation unimpeded, they effectively defer to their Democratic colleagues in a handful of House and Senate committees, and they move on. But that playbook may soon be obsolete, and no one can quite figure out how to start writing a new one. 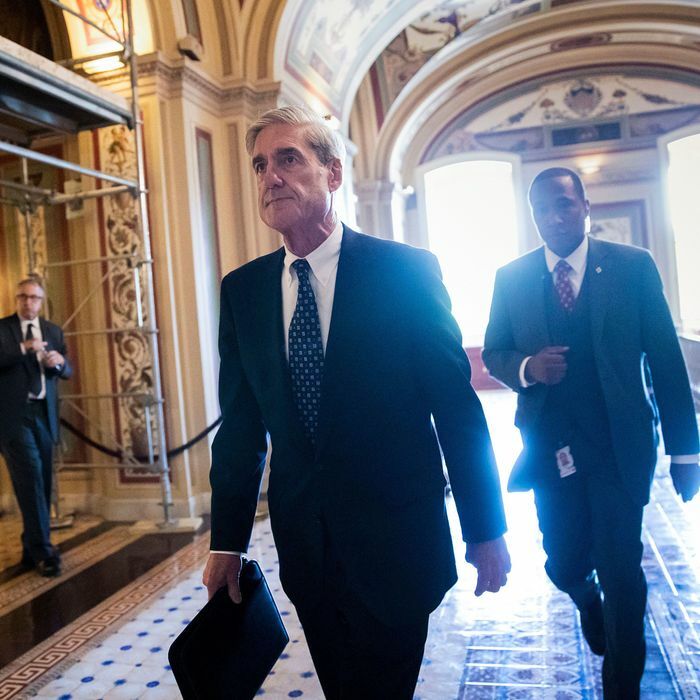 With rumors swirling that Mueller’s final report may soon be completed, and speculation simmering about whether its findings could significantly reorder not only calculations about Trump’s political standing but the rest of American politics, too, the campaigns have tried, and failed, to find good answers about how to handle what comes next — whether the investigation spits out a bombshell or a dud, or, maybe most likely, a prolonged fight over its disclosure. Many of the campaign teams have, at some point in recent months, sat down to discuss what exactly they should do or say when the report drops, but each has also run up against a seemingly insurmountable problem: There’s very little telling what’s in it, and no lean and overstretched campaign staff is realistically going to be able to draw up useful road maps for so many different scenarios. “You can try to assess, but there’s no real planning,” sighed a senior adviser to one top-tier candidate in the race. “You’d have to game out 20 different scenarios,” added a top aide to another prominent Democrat expected to jump in soon, rhetorically throwing up her hands. So there are no secret Mueller war rooms in Baltimore or Newark or Boston or Burlington, and no detailed contingency memos circulating in Wilmington or Seattle. Multiple current senior campaign aides said their full plan for now consists of continuing to wait impatiently and trying to gather hints about Mueller’s timing, just like the rest of the political world. The result is a partial paralysis for some campaigns: More than one candidate’s advisers said they’re holding off on scheduling major speeches, newsmaking announcements, or TV town halls until after the initial Mueller dust has eventually settled, concerned that their news will be completely overwhelmed if they inadvertently schedule something for the day the report is eventually filed, or revealed. Former Colorado governor John Hickenlooper’s team, for one, tracked rumors of the report’s potential timing while planning his campaign launch this week, for fear that his Day One would be completely overshadowed. An adviser to another campaign that’s been planning a kickoff in recent weeks said his team debated whether to exclude Fridays from consideration altogether, since that’s when Mueller-related news has tended to drop. Among the strategic considerations facing most operatives and candidates running the higher-profile campaigns is whether it’s worth trying to construct a distinctive immediate reaction to the news — whatever it ends up being — in order to play a part in the first news cycles. Unwilling to plan out such a wide range of potential statements, tweets, and declarations, however, many campaign teams have concluded that they’ll probably be safest waiting out the first wave of fury and commentary — for a few hours, or days, if needed, especially since there’s no telling where their candidate will be, or what they’ll be doing, when the news finally drops. But for some candidates whose campaigns (extant or expected) have not yet been fully defined, the results of the report could also provide them with a potential opportunity to craft an of-the-moment message to set the tone for their overall bid. Still, some front-runners are unlikely to alter their stride. Neither Joe Biden nor Bernie Sanders mentions Mueller much at all in public, and the probe is mostly irrelevant to their central messages — and neither has spent much time even considering how to handle the eventual revelations. Biden, for one, hasn’t let the looming report’s timing play any part in his own thinking about when to launch, or how (or whether) to, said people familiar with his thinking. Yet another small group of candidates, however, is comfortable sitting back because they are in a unique position, already having some association to the Trump investigations, at least in the public eye. Kamala Harris, for one, is a member of both the Intelligence and Judiciary committees in the Senate. Her team has not fully gamed out potential responses, but she’s already spoken publicly about her expectation that the report be as transparent as possible, and she — like Amy Klobuchar and Cory Booker, fellow Judiciary members — have also been prominent participants in the public discussion about protecting the investigation during the confirmation process for Attorney General William Barr. They will have extra credibility when they respond, they believe, so they have an extra responsibility to take their time to get it right. California congressman Eric Swalwell, another likely candidate, is in a similar spot as a member of the House Intelligence Committee. But it’s relative long-shot candidates like Swalwell who think Mueller might offer them the clearest potential opportunity to break through. The candidates who are least known have, by definition, the greatest opening to try and define themselves to the electorate in the wake of what’s likely to be the biggest news spectacle in months, if not years. So strategists aligned with a wide range of candidates said they expect that group to try and take the boldest stances, or to be the loudest, in the immediate aftermath of the news drop. Calls for impeachment, for example, may come loud and fast among the crowd polling at or under one percent. The general guideline Democrats have followed for two years of reserving judgment, lest the report become overly politicized in the public view, is wearing thin, after all. But given Trump’s constant attacks on Mueller, and an energized chunk of the Democratic base’s interest in the matter, its time was long coming anyway. Still, their slice of the news avalanche will almost certainly be vanishingly small. And it’s not just Democrats who are thinking through whether to try and make a splash if the report is especially damning. A handful of Republicans, like Maryland governor Larry Hogan, have signaled that they may consider jumping in the race if Trump is sufficiently hobbled. And John Kasich has been open about considering a primary challenge. The results of Mueller’s investigation are likely to play a considerable role in his ultimate determination. The former Ohio governor last week sat for a series of briefings, organized by his political advisers, with former counterintelligence and law enforcement officials, according to a Republican familiar with the meetings. Also included on Kasich’s itinerary: experts in the procedures of both special prosecutors and the Southern District Court of New York. He’s scheduled to convene his team to discuss a political plan of action next.